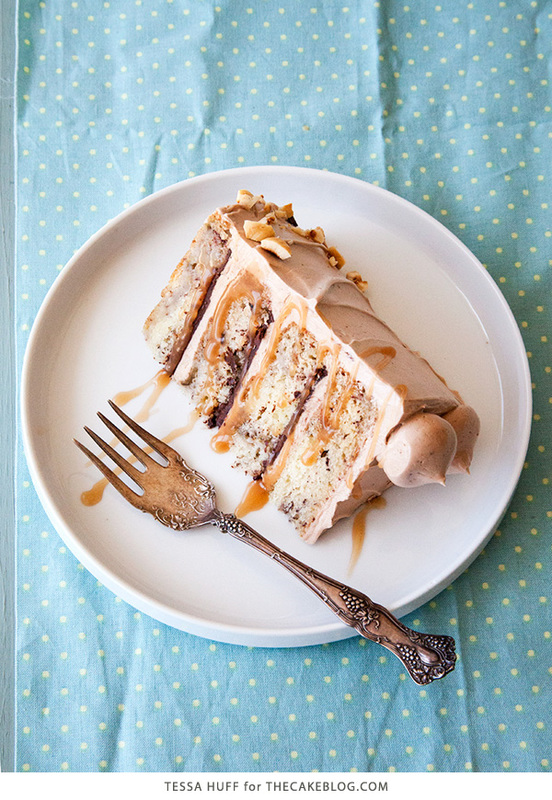 Our contributor, Tessa Huff, is sharing a chocolate hazelnut cake recipe. 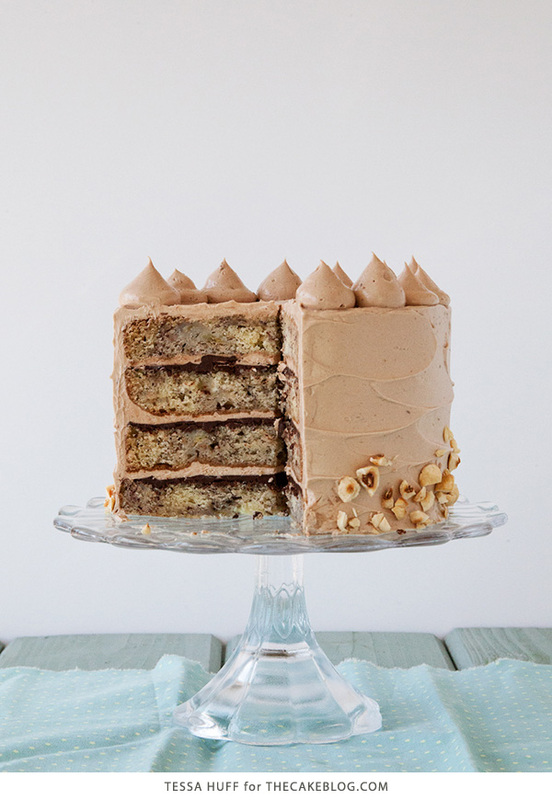 Banana cake with chocolate ganache filling and chocolate hazelnut buttercream. It’s the peak of summer, and I am sure we are all starting to feel the heat. You are most likely reaching for all your favorite frozen treats every afternoon. One of my favorites is a frozen chocolate-dipped banana. Yumm! I’ve been seeing recipes for bite-sized varieties pop up on several of the desserts blogs lately, so I was inspired to make you all a cake version. So this cake might not actually be frozen or super cool and refreshing, but it is extremely flavorful. And fairly sinful. So if you can’t beat the heat, then you might as well indulge. If you are courageous enough to brave turning on the oven, then you deserve a slice of this rich and extremely moist cake. 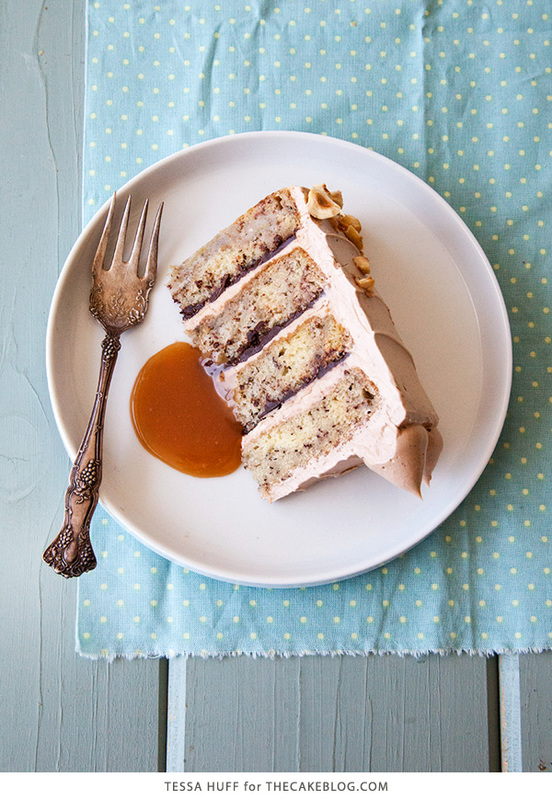 Like the frozen treat, layers of banana cake are paired with dark chocolate. 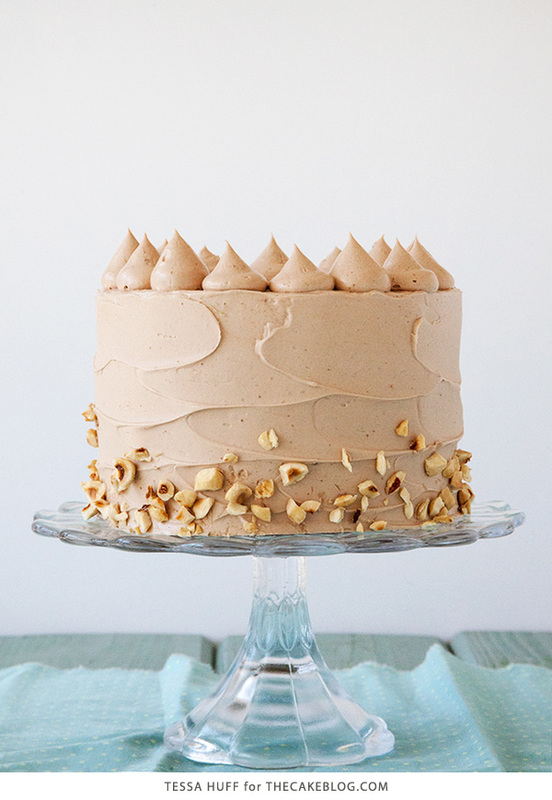 To elevated this cake, I created a chocolate-hazelnut buttercream. The buttercream was used in the filling as well as frosting. Might as well send a spoonful straight to your mouth while you are at, it’s that good. I’ve garnished the cake with chopped, toasted hazelnuts for added texture and extra crunch. 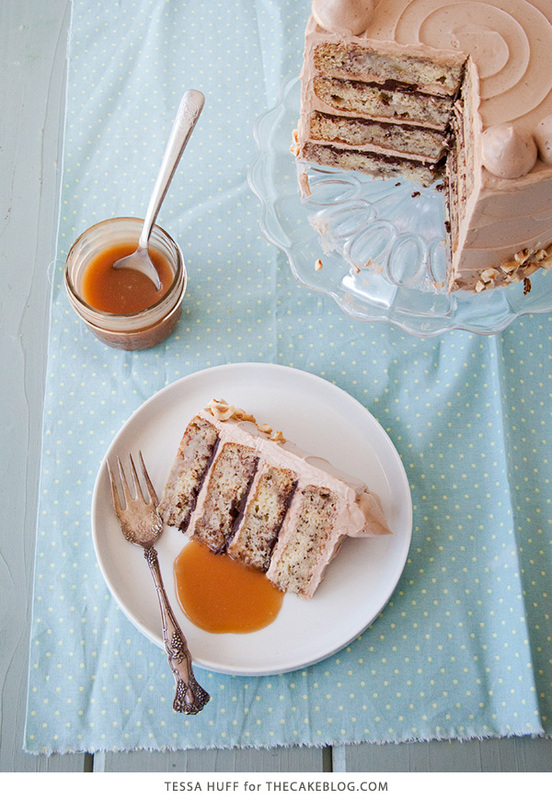 Serve with salted caramel sauce to tie it all together. Pre-heat oven to 350 degrees. Butter and lightly flour two 6″ round pans. Mash ripe bananas in a small bowl with a fork and set aside. In a medium bowl, whisk flour, baking powder, baking soda and salt until well combined. Set aside. With the mixer on low, add eggs one at a time, fully incorporating after each addition. Add vanilla extract. Stop the mixer. Scrape down the sides and bottom of the bowl. Mix in the yogurt or sour cream. Fold in the mashed bananas until combined. Pour batter into prepared pans and bake until golden – about 22-25 minutes for the recommended size. Chop the chocolate and place in a heat-safe bowl. Heat the cream over medium-low until it starts to simmer. Be careful not the burn the cream! Once it starts to come to a low simmer, pour over the chopped chocolate. Let sit 30 seconds before whisking together until smooth. Let cool before use. Place egg whites and sugar in the bowl of an electric mixer. Whisk until combined. Fill a medium saucepan with a few inches of water and place over medium heat. Place the mixing bowl on top of the saucepan to cream a double-boiler. Whisking constantly, heat the egg mixture until it registers 160 degrees on a candy thermometer. Carefully transfer the bowl onto the stand mixer. Swap out the whisk attachment for the paddle. With the mixer on low, slowly add cubed butter and mix until incorporated. Add vanilla and chocolate hazelnut spread. Whip on medium-high until silky and smooth, about 3 to 5 minutes. Slice cooled banana cakes in half, horizontally, to create four layers of cake. Spread a layer of ganache on top of the bottom layer of cake. Add a layer of buttercream on top of the ganache. Place the second layer of cake on top of the buttercream and repeat. Ice with the remaining buttercream. Garnish with chopped, toasted hazelnuts – if desired. 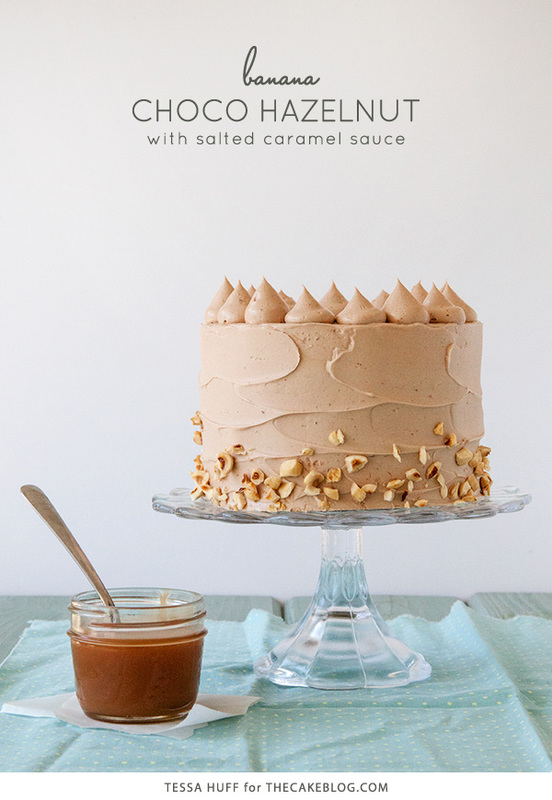 Serve with salted caramel sauce! This looks amazing! Love the flavor combo. Pinned! Wow…this looks delicious. Thanks for sharing!!! I made a gluten-free and dairy-free version of this cake and it turned out wonderfully! The flavor combination was wonderful, I got great feedback on it, and my uncle even ate it for breakfast the next day 🙂 Thanks for the recipe! This looks absolutely amazing and divine! Pinning! hi, is there supposed to be some hazelnuts in the sponge or something? i can only see some hazelnuts on the outside of the cake for the whole recipe? Looks great! There is chocolate hazelnut spread in the frosting. Yum! I made this cake, following the recipe exactly. To prepare my cake pans, I sprayed them with Pam Baking Spray with flour in it, then lined the bottoms of the pans with a circle of baking parchment and sprayed it. My cakes fell right out of the pans, no issue. The cakes took much longer to bake than the recipe said; I just kept checking until a toothpick came out of the cake clean. The top edges became hard and crusty when cool, so I just used a sharp steak knife to trim them off, no sweat.This recipe made way more ganache than you need to apply a “smear” to each layer, I would recommend cutting it down to 2/3 or even 1/2, unless you want a ton left over. The Nutella frosting came out perfect, my husband and I were licking the bowl! Assembled, my cake looked almost just like the recipe’s picture, and my family enjoyed it very much; rich, moist, dense, delicious! If you refrigerate it, as I did, make sure you leave it out for an hour before serving. Thank you for a great recipe, Tessa Huff! I’ve tried to make this cake twice, both times the buttercream icing has turned out super runny and I don’t know why or how to fix it. Any thoughts/suggestions? This buttercream is meringue based, meaning you make a meringue first and then add the butter and flavorings. You should have nice peaks after beating the egg and sugar mixture. Then it will ‘break’ and look runny or curdled when you add in the butter. Just keep mixing until it comes back together into a silky smooth texture. This can take 10 minutes sometimes! If it is still too runny, it can be caused by the mixture being too hot. Simply refrigerate it for a few minutes to cool it off (but don’t let it get cold and set up into a solid). Then mix it again. The recipe instructions are not well written. The sponge I made following these instructions very carefully were no where near as thick as shown in the image. For the amount of chocolate you would spread on the layers, which is very little, there is way too much chocolate mixture left over – bit of a waste. As for the buttercream, very difficult to use as an icing, I believe something to set the mixture so it can be used as an icing is a must, especially if making/serving on a warm day.I believe the image presented of the cake is a bit deceiving to be honest. Although the flavour combinations go nicely, I would make some alterations to the recipe to make it more practical. Unless you are a very experienced baker – my suggestion is to think about this cake carefully before making it. I made this cake today for my10 year old daughter’s birthday! It was fantastic!!! Thank you for a lovely free recipe! I follow your pinterest as well as your Instagram account and adore your cakes as well as all the photos. This one looks amazing too. oNE Question: How do you do the swirl pattern with the frosting on top of the cake? It looks so good but I can never find any tutorial on this type of technique. If you could describe it, I would appreciate it a lot. The cakes are beautiful. However, I am more interested in the antique forks you photo the cakes with, especially the one with the banana choco hazelnut cake.. Do you know the maker and style of this fork. I am sure it is no longer available unless I get lucky in an antique store. That is the most amazing looking and sounding cake! Thank you for sharing! This looks amazing!! Found this from Cupcakes & Cashmere’s post and I will definitely have to try this recipe out. unusually amazing and teasingly mouthwatering! Thanks for the recipe! I made the cake and paired it with white chocolate cream cheese Italian meringue buttercream and salted caramel. SOOOOO good!! I will try the chocolate and hazelnut soon. I would suggest doubling this recipe for the cake or using a smaller pan. The layers were super thin and I wished I had double the recipe because they are waaaay too thing to cut in half. This recipe calls for 6″ round pans, which are slightly smaller. Where is the caramel sauce recipe? Since this recipe already involves several steps, we recommend using a store bought caramel sauce. I love everything about this! The flavor combinations are amazing and it looks so pretty! Love! I only have two 8 inch cake pans and one 9 inch springform pan… any help converting? Generally speaking, you can multiply by 1.5 or 2 to bake this as an 8″ round. We’ve updated the recipe to make things more clear. Thanks for the feedback.